My department at Sheffield Hallam University – the Department of Media Arts and Communication – has a number of vacancies at present and we would love some lovely people to come and join us. Details are available on the University Website. There are also jobs in other departments and faculties if you’re not a media type – but then you wouldn’t get the benefit of working with me on a daily basis. You would get to work in the swishy building in the picture! 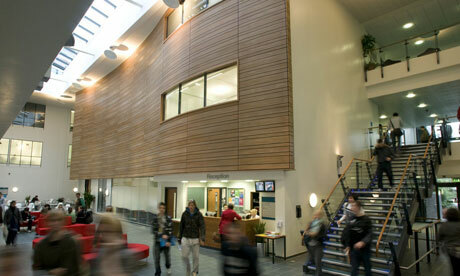 You would get to work at a university with great facilities and lovely students and colleagues! You’d get to work on a campus surrounded by several awesome independent pubs and cafes that will happily take your salary off your hands! You’d get to be in Sheffield with its fantastic festivals, theatres and pubs, proximity to the Peak District and many hills! You’d get me nagging you about your modules and the paperwork associated with them the benefits of working with me!